When vape was firstly invented in 2005, it is designed with the similar appearance to real cigarettes. After over ten years’ development, vapes nowadays are of various shapes and colors. It seems that there is no niche market left for exploration and all needs seems to have been satisfied. However, there are always someone that break through all the ties and restrains and find a newly emerged need to be satisfied, because nothing can stop an innovative mind. Though colors available for different vapes are of rich variety, only a minority of vapes are unique and with their own features. Eleaf iJust S, a cylindrical shaped vape with unique design, is one of the minorities. For the majority of the vapes, the general colors are black white and silver, and some vapes are with patterns decorations. The colors available for iJust S cannot be simply described as red, green or blue. Instead, it is wood grain, red crackle, dazzling, brushed black, brushed bronze. Wood grain, as its name suggests, imitates the color of wood, which is highly resemble to real woods and of high quality feel. Red crackle is a black bottom color with red cracks. Dazzling color is of various gradually changing colors, which looks like a rainbow and it reflects different colors when lights casts on it. Brushed black and brushed bronze are similar. They seems like black metal and bronze after times of brushes and usage. It looks more smooth and less bright than ordinary black and bronze. iJust S, with its uniqueness in colors, sticks out from other vapes and adds much interests and colors to our vaping life. 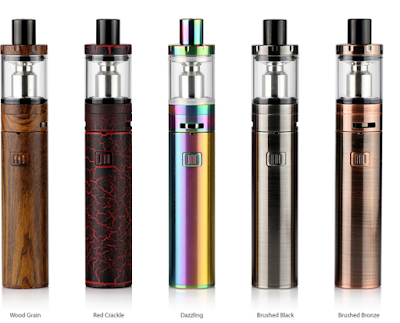 Eleaf BASAL Kit, You Deserve It!